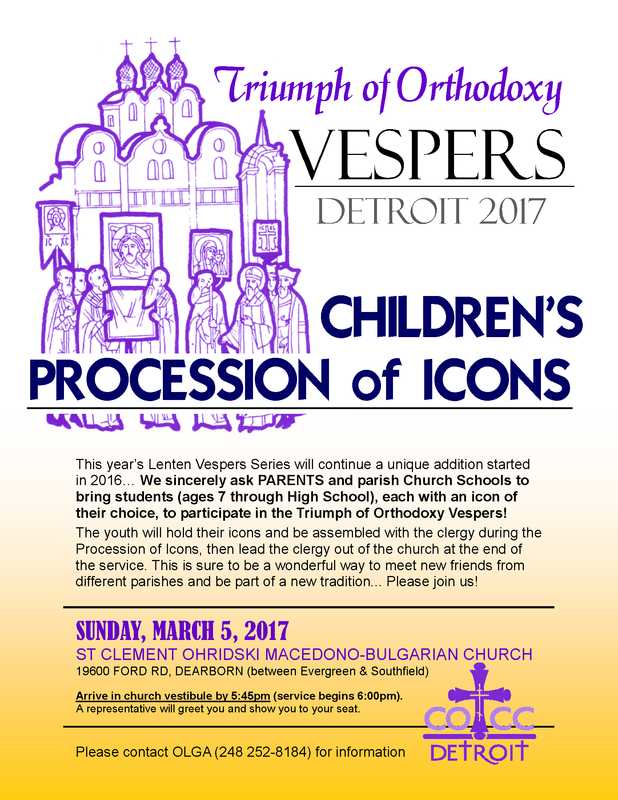 DETROIT, MI [COCC] -- As part of the Inter-Orthodox Vespers celebrating the Triumph of Orthodoxy at St. Clement Ohridski Macedono-Bulgarian Church in Dearborn on Sunday, March 5 (see details here), the Council of Orthodox Christian Churches of Metropolitan Detroit (COCC) invites children from all of our area parishes (ages 7 through High School) to bring with them an Orthodox Christian icon of their choice and participate in the Procession of Icons that will take place at that service. The youth will be seated together in the church, then join the clergy during the Procession of Icons and lead them out of the church at the end of the service. This is sure to be a wonderful way to meet new friends from different parishes and be part of a new tradition begun in 2016. Children are asked to arrive in the church vestibule no later than 5:45 p.m. (service begins at 6:00 p.m.), where a representative will show you to your seat.